COLUMBUS GROVE— If you’ve been following the Lady Lancers to this point of the season you will see a common trend. Runs, and lots of them. The Lady Lancers run ruled Columbus Grove Thursday, 16-4, which was their sixth win by run rule in just 10 games. Through 10 games Lincolnview is outscoring their opponents 126-42. Since they lost on Saturday to Wayne Trace, 4-3, the Lady Lancers have won three straight games by the following tallies; 22-3, 17-1 and 16-4. So while 16-4 win against a conference rival could be a highlight for most teams, it’s become somewhat of a formality for the Lady Lancers. At the center of it all is Destiny Coil, who on Thursday brought in four RBIs. This was a day removed from bringing in seven runs— Coil hit a home run in each game this week. 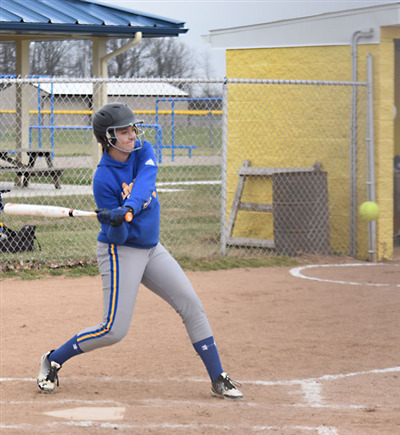 Lincolnview brought it right to Columbus Grove, as they batted around in both the first and second inning, scoring four and five runs respectively. The second inning started with Lakin Brant getting hit by a pitch, and Kendal Bollenbacher singling before Coil brought them all in with a home run. The Lady Bulldogs struggled with finding the zone, as they allowed more free passes (8 walks, 6 HBPs) than hits (7). Brant and Bollenbacher were granted first base a combined seven times Thursday. Morgan Miller was the only Lincolnview ball player with multiple hits. She had two singles, which led to two runs and two RBIs. Amy Beair was on the mound for Lincolnview. She completed the game with the win, allowing four runs on seven hits. She struck out two and walked one. Lincolnview will host Celina, Crestview and Fort Recovery, Saturday.